Allen S. Ho MD is Associate Professor of Surgery, Director of the Head and Neck Cancer Program, and Co-Director of the Thyroid Cancer Program at Cedars-Sinai Medical Center. As a fellowship-trained head and neck surgeon. His practice focuses on the treatment of head and neck tumors, including HPV(+) throat cancers and thyroid malignancies. He leads the multidisciplinary Cedars-Sinai Head and Neck Tumor Board, which provides consensus management options for complex, advanced cases. Dr. Ho’s research interests are highly integrated into his clinical practice. His current efforts lie in cancer proteomics, HPV(+) oropharyngeal cancer pathogenesis, and thyroid cancer molecular assays. Dr. Ho has published as lead author in journals that include Nature Genetics, JCO, JAMA Oncology, and Thyroid, and is Editor of the textbook Multidisciplinary Care of the Head and Neck Cancer Patient (Springer 2018). Dr. Ho serves on national committees within the AHNS and ATA, and leads a national trial on thyroid cancer active surveillance (ClinicalTrials.gov ID: NCT02609685). He maintains expertise in transoral robotic surgery (TORS), minimally invasive thyroidectomy approaches, and nerve preservation techniques. Dr. Ho’s overarching aim is to partner with patients to optimize treatment and provide compassionate, exceptional care. Thyroid cancer tends to strike younger patients. Prostrate cancer tends to be older. Vigilancia activa en el tratamiento del microcarcinoma de tiroides. M. Regina Castro, MD is a consultant in the Division of Endocrinology at the Mayo Clinic in Rochester, MN. She is an Associate Professor of Medicine. She is the Associate Program Director for the Endocrinology Fellowship program, and Director of Endocrinology rotation for the Internal Medicine Residency. She is also a member of the Thyroid Core Group at Mayo Clinic. She served from 2009 to 2015 as Thyroid Section Editor for AACE Self-Assessment Program and has authored several chapters on Hyperthyroidism, Thyroid Nodules and thyroid cancer. She has served on various committees of the ATA, including Patient Education and Advocacy committee, the editorial board of Clinical Thyroidology for Patients (CTFP), Trainees and Career Advancement committee and is at present the Chair of the Patient Affairs and Education Committee. She currently serves on the ATA Board of Directors. Her professional/academic Interests: Clinical research related to thyroid nodules and thyroid cancer, clinical care of patients with various thyroid diseases, and medical education. When to remove a nodule even if no cancer? ¿Cómo será la vida después de la cirugía? The 5-year survival rate for invasive thyroid cancer is 97.9%, and the 10-year survival rate is more than 95%, according to the National Cancer Institute. This leads some people to refer to it as a "good cancer." The number of thyroid cancer survivors is rising rapidly due to the combination of an increasing incidence, high survival rates, and a young age at diagnosis, according to Dr. Grogan and co-author Briseis Aschebrook-Kilfoy, PhD, Assistant Research Professor in Epidemiology at the University of Chicago Medicine, who lead the North American Thyroid Cancer Survivorship Study (NATCSS). The incidence of thyroid cancer will double by 2019 and thyroid cancer survivors could soon represent up to 10% of all cancer survivors in the United States, the researchers predicted. But there’s a difference between surviving and living happily ever after. Once treatment is over, thyroid cancer survivors then face a high rate of recurrence and an anxiety-filled lifetime of cancer surveillance. When the researchers heard clinic patients express these survival concerns firsthand, they sought to study this poorly investigated area. The investigators recruited 1,174 thyroid cancer survivors whose mean time from diagnosis was 5 years (89.9% were female, average age was 48), and evaluated their quality of life using a questionnaire that assessed physical, psychological, social, and spiritual wellbeing on a 0-10 scale, with 0 being the worst. Survivors of thyroid cancer reported worse quality of life—with an average overall score of 5.56 out of 10—than the mean quality of life score of 6.75 reported by survivors of other cancer types (including colorectal and breast) that have poorer prognoses and more invasive treatments. Thyroid cancer survivors who were younger, female, less educated, and those who participated in survivorship groups all reported even worse quality of life than other study participants. However, after 5 years of survival, quality of life gradually began to increase over time in both women and men, the researchers found. In order to further understand the psychological wellbeing of the growing number of thyroid cancer survivors, the researchers plan to continue to follow this cohort for the long term. Why do thyroid cancer patients report poor quality of life despite a high survival rate? Professor Akira Miyauchi (Figure 1) is President and COO of Kuma Hospital, Center of Excellence in Thyroid Care, Kobe, Japan. He is a Japanese endocrine surgeon, and a pioneer in active surveillance, and visionary in regard to treatment of thyroid cancer. World renowned researcher, and lecturer. As the associate professor of the Department of Surgery, Kagawa Medical University, he proposed and initiated a clinical trial of active surveillance for low-risk papillary micro cancer in collaboration with Kuma Hospital in 1993. In 2001, he was appointed the President of Kuma Hospital. Since then, he has been keen on the study of evaluating treatments for papillary micro cancer, observation versus surgery. Financial burden of surgery versus total cost of active surveillance over ten years. When the laryngeal nerve is severed during thyroid surgery, it can and should be repaired, with proper surgeon skill and training. Rather than being stationery and immobile, patients should practice neck stretching exercise within 24 hours proceeding surgery. There should be no fear about separating the incision. Total cost of surgery is 4.1x the cost compared to the cost of active surveillance. In the U.S., the cost is higher. The current trend in the incidence of thyroid cancer is expected to create an added cost of $3.5 billion by 2030, to the individual and as a society. By providing patient an active surveillance brochure prior to FNA, they are more open to not proceeding with surgery for small thyroid cancer management. Patient voice restores to near normal when repair of laryngeal nerve is done correctly. All surgeons should be executing this to perfection. When doing next stretches one-day post surgery, patients report feeling much better and less pain, even one year after surgery. Protocol for delaying surgery depends on the patient’s age. Older patients are less likely to require surgery. 75% of patients will not require surgery for their lifetime. 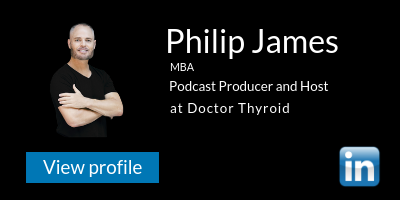 Listen to Doctor Thyroid here! Comparison of the costs of active surveillance and immediate surgery in the management of low-risk papillary microcarcinoma of the thyroid. TSH-suppressive doses of levothyroxine are required to achieve preoperative native serum triiodothyronine levels in patients who have undergone total thyroidectomy. Stretching exercises to reduce symptoms of postoperative neck discomfort after thyroid surgery: prospective randomized study. Improvement in phonation after reconstruction of the recurrent laryngeal nerve in patients with thyroid cancer invading the nerve. Listen to Doctor Thyroid here! I am a board-certified endocrinologist who specializes in caring for patients with advanced thyroid cancer. I work as part of a multidisciplinary team including surgeons, pathologists, radiologists, nuclear medicine specialists, and radiation oncologists that provides individualized care to patients treated at Memorial Sloan Kettering for thyroid cancer. In addition to treating patients I am also actively researching new treatments for advanced thyroid cancer. I am a professor of medicine at the Joan and Sanford I. Weill Medical College of Cornell University and travel extensively both in the US and abroad, lecturing on the difficult issues that sometimes arise in the management of patients with thyroid cancer. My research projects in radiation-induced thyroid cancer have taken me from Kwajalein Atoll in the Marshall Islands to the Hanford Nuclear power-plant in Washington State to regions in Russia that were exposed to fallout from the Chernobyl accident. I am an active member of the American Thyroid Association (ATA) and the Endocrine Society. In addition to serving on the ATA committee that produced the current guidelines for the management of benign and malignant nodules, I am also a Chairman of the National Comprehensive Cancer Network Thyroid Cancer Panel, a consultant to the Endocrinologic and Metabolic Drugs Advisory Committee of the FDA, and a consultant to the Chernobyl Tissue Bank. Dr. Allen Ho is a fellowship-trained head and neck surgeon who focuses on head and neck tumors, including HPV(+) throat cancers and thyroid malignancies. As director of the Head and Neck Cancer Program and co-director of the Thyroid Cancer Program, he leads the multidisciplinary Cedars-Sinai Head and Neck Tumor Board, which provides consensus management options for complex, advanced cases. Ho’s research interests are highly integrated into his clinical practice. His current efforts lie in cancer proteomics, HPV(+) oropharyngeal cancer pathogenesis, and thyroid cancer molecular assays. He has presented his research at AACR, ASCO, AHNS, and ATA, and has published extensively as lead author in journals that include Nature Genetics, Journal of Clinical Oncology, Cancer, and Thyroid. Ho serves on national committees within the ATA and AHNS, and is principal investigator of a national trial on micropapillary thyroid cancer active surveillance (ClinicalTrials.gov ID: NCT02609685). He maintains expertise in transoral robotic surgery (TORS), minimally invasive thyroidectomy approaches, and nerve preservation techniques. Ho’s overarching mission is to partner with patients to optimize treatment and provide compassionate, exceptional care. Weighing treatment options for thyroid cancer, with deep consideration for the patient’s lifestyle, could become the new norm in assessing whether surgery is the best path. Dr. Allen Ho states, “if a patient is a ballerina or an opera singer, or any other profession that could be jeopardized due to undesired consequences of thyroid cancer surgery, then the best treatment path maybe active surveillance.” Undesired consequences of thyroid cancer surgery could be vocal cord paralysis, damage to the parathyroid glands resulting in calcium deficiencies, excessive bleeding or formation of a major blood clot in the neck, shoulder nerve damage, numbness, wound infection, and mental impairment due to hypothyroid-like symptoms. Or in the case of a ballerina, undesired scarring could jeopardize a career. The above risks occur in approximately 10% of thyroid cancer surgeries. Although, some thyroid cancer treatment centers have a much more reduced incidence of undesired consequences, while others much higher. In order to address the above and remove the risk of thyroid cancer surgery, Cedars-Sinai has become the first west coast hospital to launch an active surveillance study as optional treatment for thyroid cancer. The study includes 200 patients from across the country who have chosen the wait and see approach rather than hurry into a surgery that could result in undesired, major life changes. By waiting, this means these patients will dodge the need to take daily hormone replacement medication for the rest of their lives as the result of a thyroidectomy. Although this is the first study for active surveillance on the west coast, other studies are ongoing, including Sloan Kettering as directed by Dr. Tuttle, Kuma Hospital in Kobe as directed by Dr. Miyauchi, and the Dartmouth Institute as directed by Dr. Louise Davies. Dr. Ho says the “de-escalating” of treatment for thyroid cancer will become the new trend. The active surveillance thyroid cancer team at Cedars-Sinai is orchestrated to the patient’s needs, and includes the pathologist, endocrinologist, and surgeon. The past year has been fascinating and highly fruitful year for Dartmouth Institute Associate Professor Louise Davies, MD, MS. A 2017-2018 Fulbright Global Scholar, Davis spent several months in Japan at the Kuma Hospital in Kobe, Japan, studying the hospital's pioneering surveillance program for thyroid cancer. Davies, the chief of otolaryngology-head & neck surgery-at the Veterans Affairs Medical Center in White River Junction, Vermont, has researched U.S. patients' experiences of monitoring thyroid cancers they self-identify as overdiagnosed, and has found that such patients often feel unsupported, even ostracized. Following her stay in Japan, Davies, who also develops and teaches courses in qualitative research methods in Dartmouth Institute's MPH programs, spent several months in the U.K. at the Health Experiences Research Group (HERG) at Oxford University. There, she learned skills that will help her develop web-based materials to raise public awareness about surveillance, surveillance programs, and overdiagnosis in general. As if the year wasn't packed enough, Davies also visited the site of the Fukushima Daiichi nuclear power plant, site of the 2011 nuclear accident in Japan. Unrelated to her Fulbright work, Davies is a member of an international task force organized through the International Agency for Research on Cancer, a branch of the World Health Organization. The task force will make recommendations on the monitoring of the thyroid gland after nuclear accidents. Learn more about her incredible year and what's next for her research in overdiagnosis! Q: As a practicing physician, how did your interest in overdiagnosis develop? A: My interest in over diagnosis grew from my work with Dr. Gil Welch, dating back to 2004. He was and is a mentor to me, and we developed the work on thyroid cancer together. I have always had an interest in making sure that patients receive care that aligned with their values. The problem of overdiagnosis is particularly intriguing because if people do not understand the concept, they may undergo treatment that, had they understood more about their risks, they might not have elected. Finding ways to solve that problem has been a fascinating focus for me. Q: Is overdiagnosis and/or overtreatment in thyroid cancer on the rise, if so what accounts for this increase? A: Thyroid cancer incidence has more than tripled in the U.S. over the past 30 years. The majority of the increase has been due to the detection of small cancers, which we know exist as a subclinical reservoir in otherwise asymptomatic people. As more attention has been drawn to the problem of overdiagnosis, the rate of increase has slowed, which has been gratifying to see; although it has not stopped completely or reversed. In the most recent national guidelines on the treatment of thyroid cancer (from the American Thyroid Association), there has been a clear suggestion that treatment should be more conservative for the small cancers that are so commonly detected now. It is not yet clear how much of an impact these new guidelines have had on practice patterns. Q: You've studied the experiences of patients who are diagnosed with thyroid cancer but choose not to intervene. What are some of the commonalities you've found? A: The patients who were the first to understand that their small, asymptomatic thyroid cancers picked up incidentally might not need immediate intervention, but instead could be monitored through regular checkups and active surveillance did not receive a lot of support from the medical community. Many managed their cancer by keeping it a secret, which can be stressful in itself, and several stopped getting follow ups-the recommended care if surveillance rather than interventions chosen for a small thyroid cancer. This was a unique group of patients who represented the first people to undertake what is a new and incompletely understood treatment option in the U.S. As such, they are probably more representative of people going against medical convention than thyroid cancer patients who elect to undertake surveillance, per se. Q: What will/have you been looking for when evaluating the surveillance program at Kuma Hospital? How will you combine this with your own U.S. pilot data? My goal in going to Kuma Hospital last fall was to understand more about the active surveillance program they have there. They were the first in the world to run such program and collect data on it, and have been doing so since 1993. I wanted to understand their data on active surveillance in more detail. I wanted to understand the patient experience of being on surveillance, and how the program worked operationally. I was able to do all those things and gathered patient experience data through a survey as well as interviews. I also was lucky to get to spend a fair amount of time in the operating room, where I learned a number of new surgical techniques that will advance my own practice in thyroid surgery. My goal is to report what I learned at Kuma Hospital as broadly as possible, so that people in the U.S. begin to feel comfortable adopting active surveillance as a method of managing the early thyroid cancers that are appropriate candidates for surveillance. What's next for you in overdiagnosis research? My work on the task force about thyroid monitoring after nuclear power plant accidents has given me a new appreciation for the complexity of public health communication about risk, emergency preparedness, and the problem of over diagnosis when it comes to policy setting. I hope to be able to continue to contribute in other ways to the broader public health discussion about over diagnosis. In my next steps looking at the epidemiology of thyroid cancer, I plan to focus on understanding more about why we see such variation in thyroid cancer incidence across geography, age groups, and gender. El Dr. Duque es un Cirujano de Cabeza y Cuello, formado en la Universidad de Miami, actualmente trabaja en el Hospital Pablo Tobon Uribe de Medellin. Al años opera unos 220 pacientes con problemas de tiroides, de estos la mayoría con cancer de tiroides. Que tan común es el cancer de tiroides, de estos cual es el mas común? Cuéntenos un poco sobre el tratamiento con Yodo radioactivo. Fabián Pitoia, MD, Ph D.
Docente adscripto de medicina interna. ¿qué es el microcarcinoma y qué es la vigilancia activa? Para aquellos que siguen el podcast de Doc Thyroid, es posible que conozcan mi historia, tuve una tiroidectomía y cáncer de tiroides. ¿Cuántos pacientes con cáncer papilar de tiroides ves un año? Cuéntanos más sobre la vigilancia activa ... es una nueva practica? ¿Y por qué estamos escuchando más sobre esto últimamente? ¿Cómo sabe un paciente si es adecuado para ellos? ¿Cuál es el tratamiento para los pacientes que eligen este tratamiento? ¿Todos los hospitales en América Latina ofrecen vigilancia activa? ¿Cómo puede un paciente encontrar doctores que lo ofrezcan? La Dra. Davies dice que algunos pacientes en su programa dicen sentirse "estúpidos" por dejar el cáncer en su cuerpo. ¿Hay apoyo emocional para aquellos que eligen Vigilancia Activa Microcarcinoma? Dr. McIver contributes to Moffitt Cancer Center almost 20 years of clinical experience in the care of patients with endocrine diseases, specializing in the evaluation of patients with thyroid nodules and thyroid cancer. He has a particular interest in the management of patients with advanced and aggressive forms of cancer and the role of genetic and molecular techniques to improve the accuracy of diagnosis; to tailor appropriate treatment to a patientdisease. Dr. McIver has a long-standing basic research interest in the genetic regulation of growth, invasion and spread of thyroid tumors of all types. His primary research focus is the use of molecular and genetic information to more accurately diagnose thyroid cancer and to predict outcomes in the disease. Dr. McIver received his MB ChB degree from the University of Edinburgh Medical School in Scotland. He completed an Internal Medicine residency at the Royal Infirmary of Edinburgh, followed by a clinical fellowship and clinical investigator fellowship in Endocrinology at the School of Graduate Medical Education at Mayo Clinic in Rochester, MN. Prior to joining Moffitt, he was employed as Professor and Consultant at the Mayo Clinic and Foundation in the Division of Endocrinology & Metabolism. Amongst his most proud accomplishments, Dr. McIver counts his two commitment to education of medical students, residents and fellows; his involvement as a founding member of the World Congress on Thyroid Cancer, an international conference held every four years; and his appointment as a member of the Endowed and Master Clinician Program at the Mayo Clinic, recognizing excellence in patient care. Médico de la Universidad Pontificia Bolivariana y Otorrinolaringólogo de la Universidad de Antioquia en Medellín, Colombia. Residencia en Otorrinolaringología en la Universidad de Antioquia. Fellowship , Entrenamiento exclusivo en Cirugía de Cabeza y Cuello (1996 a 1998) y posteriormente un Fellowship en Rinología y Cirugía Endoscópica de Senos para nasales (2004 a 2005) ambos en el Departamento de Otorrinolaringología de la Universidad de Miami, USA. La aparición más frecuente de cáncer de tiroides. 150 - 200 cirugías tiroideas cada año. Lo que un paciente con cáncer de tiroides debe esperar si es diagnosticado. Libro ¡Uuuyyy, TENGO CÁNCER DE TIROIDES! Dr. Jeremy Freeman was born in Hamilton, Ontario and grew up in Toronto. He attended medical school at the University of Toronto, graduating with highest honours. He completed his otolaryngology residency at the University of Toronto. After receiving his Fellowship from the Royal College of Surgeons of Canada in 1978, he spent two further years of advanced training, one as a Gordon Richards Fellow at the Princess Margaret Hospital in Toronto in Radiation and Medical Oncology and a second year as a McLaughlin Fellow, training in Head and Neck Oncology at the Royal Marsden Hospital in London, UK. He was the first fellow of the Advanced Training Council sponsored by the two head and neck societies. A Full Professor, he occupies the Temmy Latner/Dynacare Chair in Head and Neck Oncology at the University of Toronto, Faculty of Medicine. He is former Otolaryngologist-in-Chief at the Mount Sinai Hospital stepping down after fulfilling his 10 year appointment. He has an active practice focusing on head and neck oncology with a primary interest in endocrine surgery of the head and neck. He has given over 500 scholarly presentations, has been invited as a visiting professor and surgeon internationally, and has published over 280 articles in the scientific literature. He has been involved in a number of administrative roles in the American Head and Neck Society and is also on the editorial board of a number of high impact journals focusing on head and neck oncology. He has recently been appointed to the National Institute of Health (in Washington DC) task force on the management of thyroid cancer. He is the Director of the University of Toronto Head and Neck Oncology Fellowship, considered to be one of the top three such fellowships in North America. He was the program chair and congress chair of the First and Second World Congresses on Thyroid Cancer held in 2009 and 2013 in Toronto. He was the Keynote speaker at the Congress held in Boston in 2017. He has been invited worldwide to deliver keynotes in the management of thyroid malignancies. How long can someone live without thyroid replacement hormone post thyroidectomy? ¿Qué es la fobia al cáncer? Dr. Netterville is the Director of Head and Neck Surgery at Vanderbilt and is an international leading authority of treating head and neck cancer. He is one of the world's experts in the treatment of skull base tumors and has a vast clinical experience. Is thyroid cancer a cancer or just a nuisance. Chances are it is not going to kill you. Prognosis and what will happen in the long run and quality of life. Levothyroxine side-effects, including weight gain. Life after surgery and RAI. What time of day to take thyroid replacement medication. What blood tests should be ordered and is fasting necessary prior to thyroid lab work. Dr. Gilbert Welch’s work is leading many patients and physicians think carefully about what leads to good health. For Welch, the answer is often “less testing” and “less medicine” with more emphasis on non-medical factors, such as diet, exercise, and finding purpose in life. Welch’s research examines the problems created by medicine’s efforts to detect disease early: physicians test too often, treat too aggressively, and tell too many people that they are sick. Most of his work has focused on overdiagnosis in cancer screening: in particular, screening for melanoma, thyroid, breast, and prostate cancer. He is the author of three books: Less Medicine, More Health: 7 Assumptions That Drive Too Much Health Care (2015), Overdiagnosed: Making People Sick in the Pursuit of Health(2012), and Should I Be Tested for Cancer? (2006). His op-eds on health care have appeared in numerous national media outlets, including the Los Angeles Times, The New York Times, the Washington Post, and the Wall Street Journal. Welch is a professor of medicine at the Geisel School of Medicine, an adjunct professor of business administration at the Tuck School of Business, and an adjunct professor of public policy at Dartmouth College. He has initiated and taught courses on health policy, biostatistics, and the science of inference. breasts, prostate, and thyroid carry a lot of cancers. overcoming cancer phobia, and reducing patient anxiety. paradigm shift is happening in regard to cancer. Médico egresado de la Facultad de Medicina de la Universidad Nacional de Rosario. Especialista en Endocrinología egresado de la Facultad de Medicina de la Universidad de Buenos Aires. Especialista recertificado por AMA (Asociación Médica Argentina) / SAEM (Sociedad Argentina de Endocrinología y Metabolismo) años 2003 y 2009. Realizó su formación como Endocrinólogo en el Servicio de Endocrinología del Complejo Médico PFA Churruca-Visca. Buenos Aires. Argentina. Se sub-especializó en el área de Tiroides. Actualmente se desempeña como Médico de Planta del Servicio de Endocrinología del Complejo Médico PFA Churruca-Visca. Es Jefe de la Sección Tiroides de dicho Servicio. Sus trabajos de investigación se basan fundamentalmente en Tiroides. Fue docente de Fisiología de la Cátedra de Fisiología Humana de la Facultad de Medicina de la Universidad Nacional de Rosario. Es docente de la Carrera de Médicos Especialistas en Endocrinología de la Universidad de Buenos Aires. Es colaborador Docente de la Unidad Docente Hospitalaria “Churruca-Visca” dependiente de la Facultad de Medicina de la Universidad Nacional de Buenos Aires. Fue docente estable de la Carrera de Especialización en Endocrinología Ginecológica y de la Reproducción en la Universidad Favaloro. Es Miembro Activo de las siguientes sociedades: Sociedad Argentina de Endocrinología y Metabolismo y de la Sociedad Latinoamericana de Tiroides. Forma parte del Departamento de Tiroides de la Sociedad Argentina de Endocrinología y Metabolismo. Es invitado por Sociedades Nacionales e Internacionales como disertante en temas relacionados con Tiroides. Ex Director de la Sociedad Latinoamericana de Tiroides (LATS). Chair de la Educational Task Force de la Sociedad Latinoamericana de Tiroides (LATS). Otros tratamientos relacionados con el cáncer de tiroides que se necesitan? The most common question asked to Dr. Miyauchi by surgeons from around the world. Improvement in phonation after reconstruction of the recurrent laryngeal nerve in patients with thyroid cancer invading the nerve. Dr. Bridget Brady is Austin’s first fellowship trained endocrine surgeon. She has a passion for and expertise in disease of the thyroid, parathyroid, and adrenal glands. Since completing her endocrine surgery fellowship in 2006 under Matthias Rothmund, MD, an internationally acclaimed endocrine surgeon, she has performed thousands of thyroidectomies and parathyroidectomies here in Austin. Dr. Brady focuses on a variety of minimally invasive techniques to optimize patients’ medical and cosmetic outcomes. Her fellowship training in Germany and experience in Austin have enabled her to specialize in patients with recurrent or persistent disease of the thyroid and parathyroid, including thyroid cancer. She offers complete diagnostic workups including in-office ultrasounds and FNA biopsies of thyroid nodules and lymph nodes. Dr. Brady was named director of endocrine surgery for the new medical school in Austin. She was also recently chosen to teach general surgeons seeking additional training in endocrine surgery. Dr. Brady instructs these endocrine surgeons from the Baylor Scott and White fellowship program. How relevant is what I don’t know won’t hurt me in thyroid cancer and biopsies of nodules? How do you calmly tell a patient they have cancer? Dr. Gerard Doherty, an acclaimed endocrine surgeon, is a graduate of Holy Cross and the Yale School of Medicine. He completed residency training at UCSF, including Medical Staff Fellowship at the National Cancer Institute. Dr. Doherty joined Washington University School of Medicine in 1993, and became Professor of Surgery in 2001. In 2002 he became Head of General Surgery and the Norman W. Thompson Professor of Surgery at the University of Michigan, where he also served as the General Surgery Program Director and Vice Chair of the Department of Surgery. From 2012 to 2016, Dr. Doherty was the Utley Professor and Chair of Surgery at Boston University and Surgeon-in-Chief at Boston Medical Center before becoming Moseley Professor of Surgery at Harvard Medical School, and Surgeon-in-Chief at Brigham and Women’s Hospital and Dana-Farber Cancer Institute. Dr. Doherty was trained in Surgical Oncology, and has practiced the breadth of that specialty, including as founder and co-director of the Breast Health Center at Barnes-Jewish Hospital. His clinical and administrative work was integral in the establishment of the Siteman Cancer Center at Washington University. Since joining the University of Michigan in 2002, he has focused mainly on surgical diseases of the thyroid, parathyroid, endocrine pancreas and adrenal glands as well as the surgical management of Multiple Endocrine Neoplasia syndromes. He has devoted substantial effort to medical student and resident education policy. His bibliography includes over 300 peer-reviewed articles, reviews and book chapters, and several edited books. He currently serves as President of the International Association of Endocrine Surgeons, Past-President of the American Association of Endocrine Surgeons, Editor-in-Chief of VideoEndocrinology and Reviews Editor of JAMA Surgery. He is a director of the Surgical Oncology Board of the American Board of Surgery. Imaging has increased thyroid nodule discovery. Following patients with small thyroid cancer — analogous to prostate cancer. Better followed than treated. Tiny thyroid cancers can be defined by those nodules less than 1/4 inch in size. Less RAI is being used as a part of thyroid cancer treatment. This means, less need to do total thyroidectomy or thyroid lobectomy. Dry mouth and dry eyes are risks to doing RAI. Also, there is risk to developing a second malignancy. Most of the secondary cancers are leukemia. Risks to operation include changes to voice and calcium levels. Thyroid surgery is a safe operation but not risk free. Best question for a patient to ask is, who is my treatment team? The quarterback of treatment team is often the endocrinologist . Cluster of issues can happen after RAI, such as the need to carry water and eye drops for life. For some patients taking thyroid hormone replacement, their blood levels are correct, but still does not feel well on standard treatment protocol. By the end of two weeks, most people go back to what they were doing before surgery with a relatively normal state. Scarring reduction; massage, aloe, Vitamin E.
Dr. José A. Hakim realiza más de 400 cirugías al año. Es cirujano general. Especialista en cirugía de cabeza y cuello en relación con el cáncer. No todos los cánceres de tiroides deben ser operados. No todos los nódulos tiroideos deben ser biopsiados. La mitad de la población tiene nódulos tiroideos. El 10% de esos nódulos tienen cáncer. En Colombia, 2,5 millones de personas tienen cáncer de tiroides. 15 millones de personas tienen cáncer de tiroides en los Estados Unidos, y lo más probable es que no lo sepan. Los estudios muestran que el 30% de los cadáveres tienen nódulos tiroideos con cáncer. Comprender las repercusiones de hacer una biopsia. Si se trata de un nódulo que no requiere cirugía, incluso si es cáncer, decirle a un paciente esto a veces hace más daño en la forma de estrés emocional que lo que es necesario. No sacrificar una tiroides debido a la fobia. La carga es en el médico para no desencadenar paranoia y estrés en el paciente diciéndoles que "podría" tener cáncer, en el caso de llevar a cabo una biopsia en un nódulo cuando no es necesario. Una tiroidectomía cambia una vida, incluyendo la piel seca, aumento de peso, calcio, pérdida de voz o cambio de voz - estos pueden ser peores que vivir con cáncer de tiroides papilar. ¿Qué necesita ocurrir en la comunidad médica para cambiar el paradigma que no necesitamos para operar en todo el cáncer de tiroides? La patología es la clave para cambiar el paradigma. El cáncer no es igual en todos los casos. Piense en el cáncer de tiroides similar a la vista sobre el cáncer de próstata en los hombres. Dr. Shaha specializes in head and neck surgery, with a particular interest in thyroid and parathyroid surgery. He uses an algorithm of selective thyroid tumor criteria (the size, location, stage and type of cancer, along with the patient’s age), to tailor therapy to each individual’s circumstances. This can help thyroid cancer patients avoid unnecessary and potentially damaging over-treatment, while still providing the best option for control of their cancer and better quality of life after treatment. Dr. Shaha works very closely with Memorial Sloan Ketterings’ endocrinologists to monitor the careful post-treatment hormone balancing necessary for thyroid cancer patients. Many academic hospitals and medical societies worldwide have invited Dr. Shaha to speak on the principles of targeted thyroid surgery and to share his expertise in the treatment of head and neck cancers. The first question a surgeon should ask and why. When talking active surveillance or observation, changing the language to deferred intervention, ‘we are going to defer’. The biology of thyroid cancer is a friendly cancer. Anxiety when diagnosed with cancer. Medical legalities — spend a lot of time with patient — and empower patient. Let the treatment not be worse than the disease. Large tumors, more than 4 cm, bulky nodes, voice hoarseness, vocal cord is paralyzed. All circumstances where surgery maybe advocated. If a tumor is benign but there is presence of compressive goiters, or deviation of trachea or swallowing difficulty. Considering the condition of the patient, age, cardiac issues. When voice is critical to the patients livelihood, such as teachers, politicians, and singers. Main three complications of surgery include bleeding, change of voice, calcium problems. Cancer treatment requires a team: surgeons, anesthesiologist, pre-op, radiologist, pathologist, endocrinologists, oncologists. When wind pipe is involved with tumor. When in surgical business a long time, you become humble no matter how good you are. God gave you an organ — you took it away — now you are on a pill — since the surgery its ’just’ not the same. When treatment is out of the box — many will not agree with you. How to develop a scale to measure quality of life. To avoid scarring, surgery maybe conducted through the armpit in Korea and Japan. Progress in understanding biology of thyroid cancer only cancer, that there is 98% survival. This episode is recorded from Boston and the World Congress on Thyroid Cancer, where leading doctors and researchers have gathered to share the latest medical research and trends related to thyroid disease. He helped write the Japanese guidelines on thyroid cancer. He is Professor & Chair of the Department of Surgery at Tokyo Women’s Medical University. Most Western countries carry out total thyroidectomies, whereas in Japan, the approach is more conservative with a fundamental practice of hemithyroidectomy whenever possible. By not doing a total thyroidectomy, this allows the patient to not avoid taking thyroid replacement medication. Complete thyroidectomy is conducted when 80-90% of lymph nodes have metastasis. For I-131 treatment, patients wait more than 6 months post surgery. When receving I-131 treatment, patients be admitted to hospital for several days. TSH suppression therapy is common in Western countries, whereas in Japan, measures are taken to avoid TSH suppression by not removing all of the thyroid. Normal TSH in Japan is 4.3 or less. Culturally, Japanese patients are typically conservative compared to Western countries. Even high risk patients opt for no TT. In Japan people are less aggressive and more patient as a culture, and this is reflected in their approach to treating thyroid cancer. For medullary thyroid cancer, treatment management differs in japan. In Westerm countries, they receive TT. But, in Japan, if its not familial it is treated with hemithyrodectmy. Only when familial, is it treated with TT. Follicular diagnosis is difficult, benign and malignant is a big issue. Active surveillance is spreading now, the question is why? We must consider the patient’s view. Research from Japan focuses on the size of tumor, but must consider patient’s view.